In last week’s Five Senses class, we talked about the core science process skills of Observation and Communication. This week, those skills formed the foundation for our work on a third process skill: Classification. 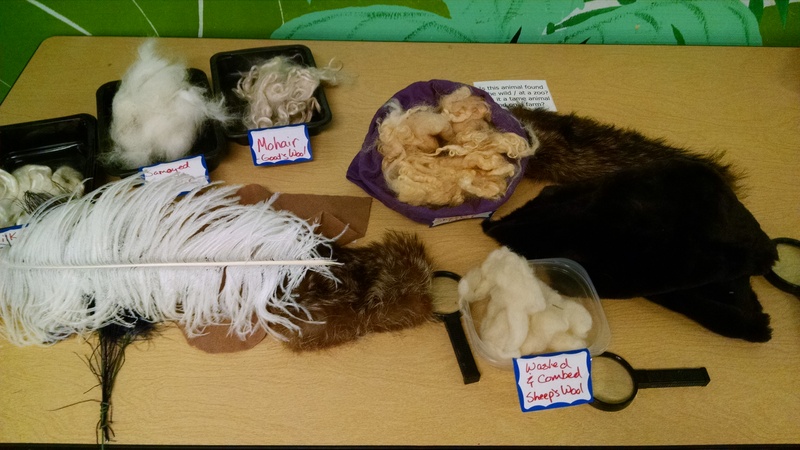 We taught this in the context of Taxonomy – sorting animals into category by class, because that is a fun and engaging topic for kids, and it’s an easy way to introduce and focus on this core skill. There are three steps needed to sort objects into categories. Observe What does it look like? Compare How are 2 things LIKE each other? Contrast How are 2 things DIFFERENT from each other? Once you’ve assessed what you’re looking at, then you decide the criteria by which you want to sort…. am I sorting by how many legs an animal has, or am I sorting these objects by color, or by size? Then you decide which category to put the item into. These are great base skills to teach your child and to practice anytime: putting silverware away in the drawer, sorting laundry, matching socks, deciding which basket to put your Duplos in, and where to put your stuffed animals. 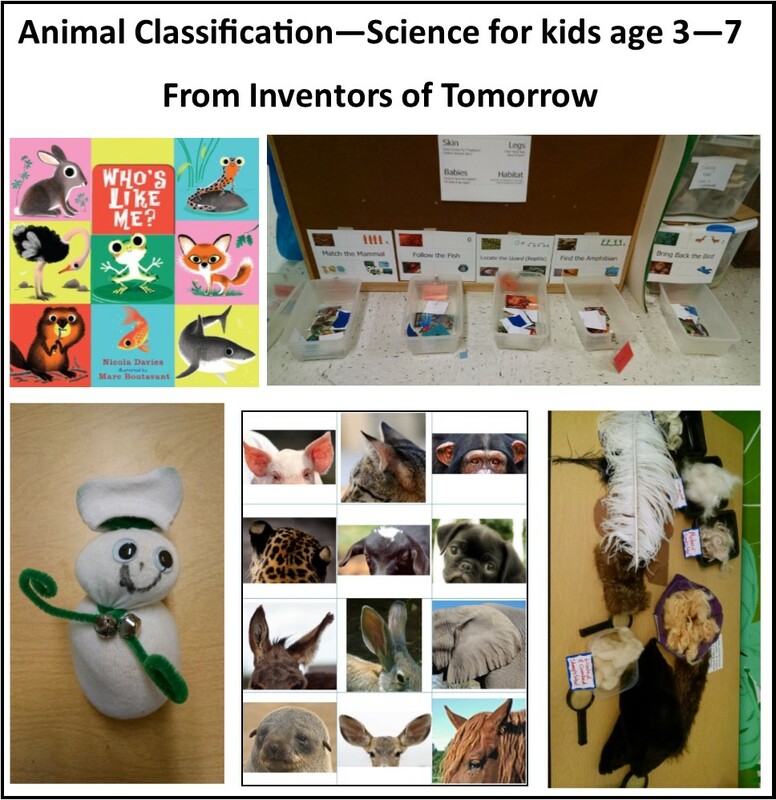 So, as always in our class structure, we started with discovery time, where our kids have a chance to explore all our activities, then we do opening circle to cover the key concepts of animal classification, (see below), then we have tinkering time to play with everything more. Then after outside time, we end with closing circle to share what we learned. Fishing & sorting. 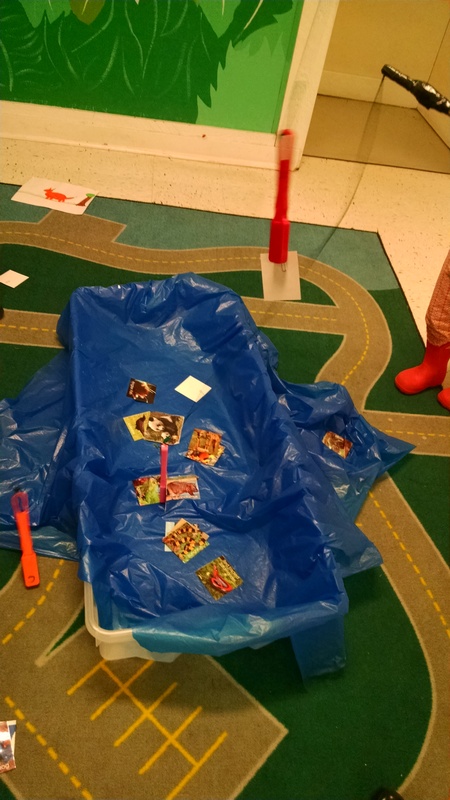 Set up a “pond” – we’ve used a kiddie pool with a foot bridge next to it, or a large plastic tub filled with a blue tarp. Make animals to catch: you could glue magnets or washers onto plastic animals. We printed these pictures from Confessions of a Homeschooler, laminated them, and fastened a paperclip to each one. Make fishing poles: poles or dowels with a magnet tied on. Kids then “fish” for animals. Once they caught one, they could sort it into one of five buckets: mammal, reptile, fish, bird, or amphibian. We had signs hanging above each bucket that showed four characteristics of that type of animal: type of skin, number of legs, how babies are born, and where they typically live. (Here are the Sorting into Categories posters, if you want to print your own.) Optional: you could add one more bucket labelled ??? so if a child didn’t know an answer, they could just place the animal there and move forward with the game rather than feeling stuck. 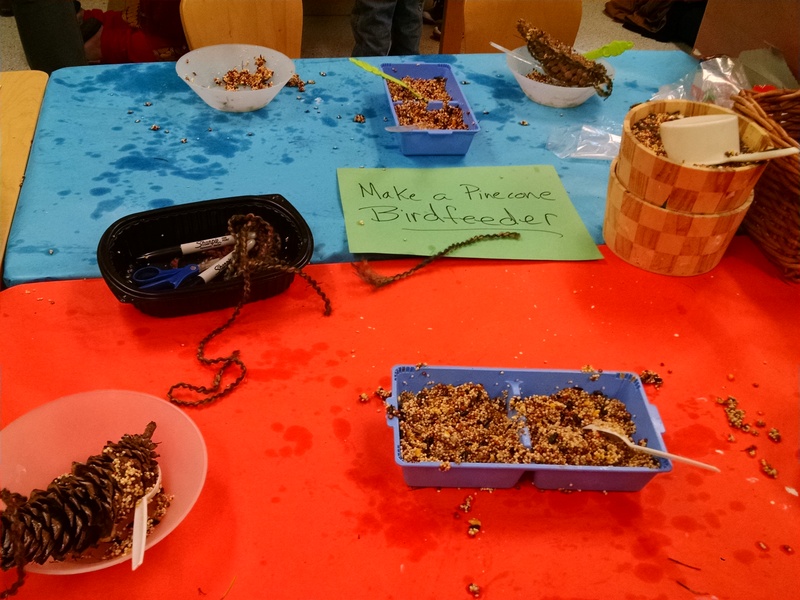 This activity was a good example of how one class activity can work for kids of a wide range of ages. 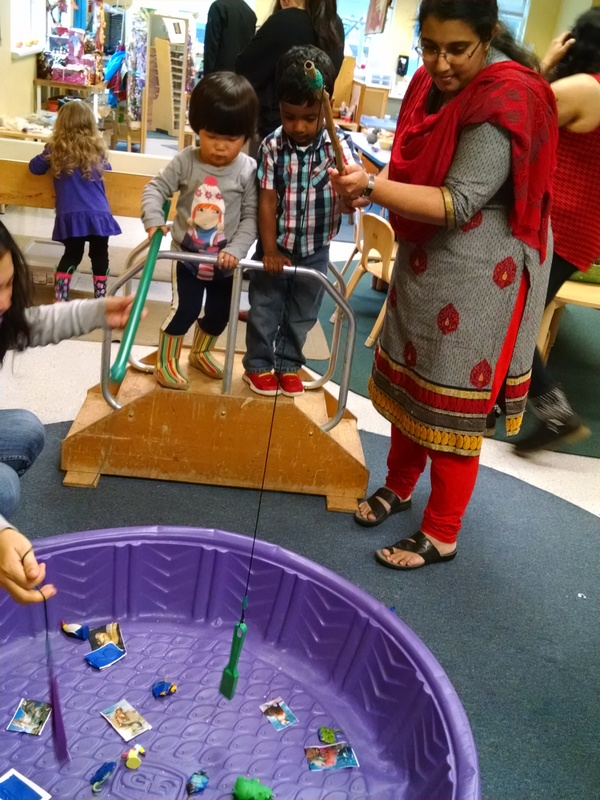 For our three-year-olds, it was just fun to fish – good large motor and small motor practice. 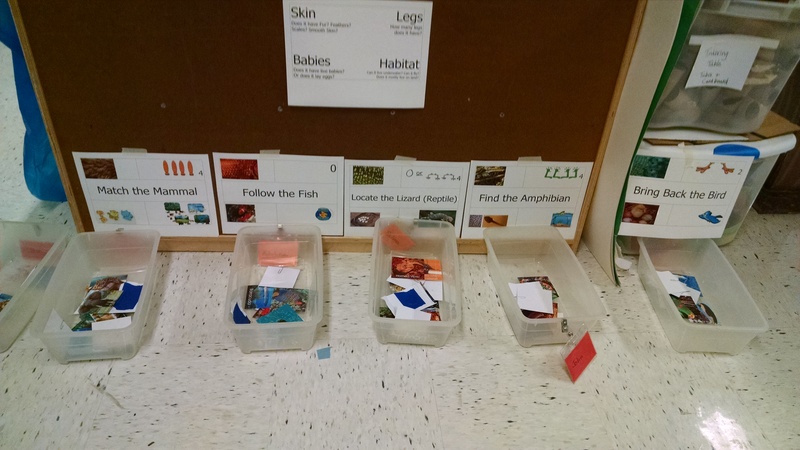 We encouraged them to sort items into buckets just by asking: is that a fish or a bird? The four to five-year-old kids also enjoyed the fishing, but we encouraged them to think more about not just what category something belongs in, but why. We’d ask questions like: what kind of skin does it have? How are its babies born? We had a few trickier animals in there, such as bats… even though they have wings, they’re not birds. We talked a little about marsupials and how their babies are born live but small and spend time in a pouch. 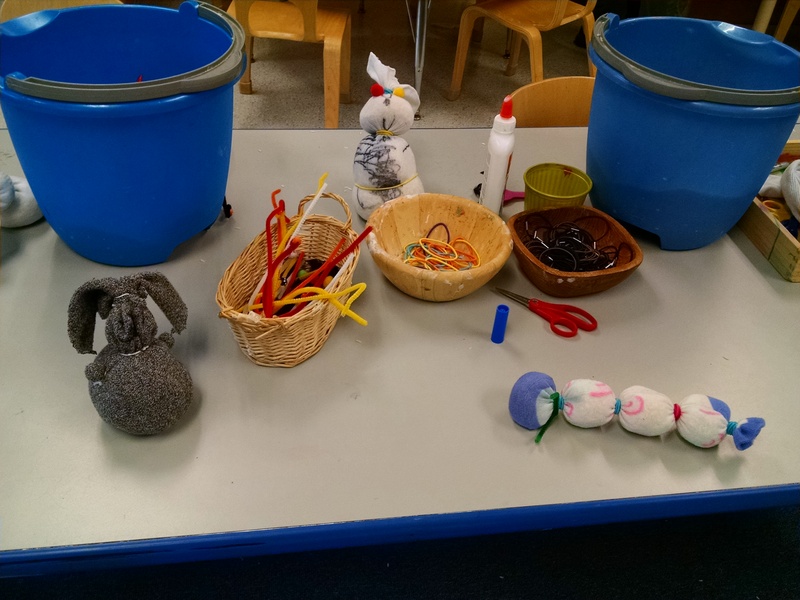 For the six and seven-year-olds, we asked them to put animals in the buckets, but also tell us other examples of each type of animal. Tool of the week: magnifying glasses. 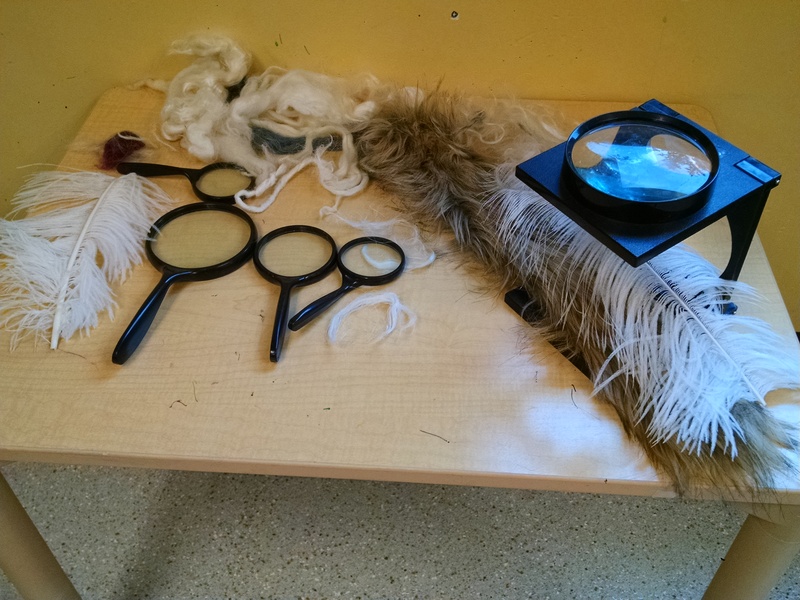 We had several magnifying glasses, plus things for kids to examine: fur, fake fur, feathers, sheep’s wool that had been carded. At circle time, we also had a small piece of lizard skin we showed them. It was from a leopard gecko, so you could see the spots on it, so we shared it with them when we read the page in our book that showed a picture of a leopard gecko. 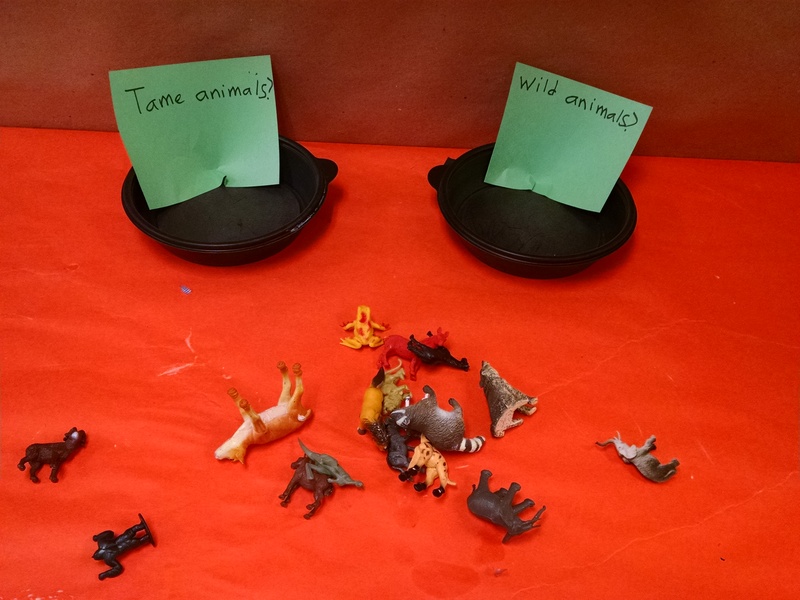 Sorting activity: Two containers, labeled “wild animals” and “tame animals” or “animals you’d find on a farm” and “animals you’d find in a zoo.” A collection of plastic animals to sort into the two containers. Whose Ears / Whose Nose – this is an activity you could also use in the five senses theme or in the animal adaptations theme. Here’s the free printable PDF. I’ve gathered photos of several kinds of animals where I’ve cropped them to show just the ears or just the nose, and kids have to guess what animal it is. Animal Classification Board Game – this is best for kids age 5 and up. Give them a stack of pictures, and encourage them to walk themselves through this chart to decide what kind of thing they have. Animal Mix and Match: There are several puzzles and books which allow you to mix and match the heads of different animals with different bodies and different tails. We used this printable: http://www.itsybitsyfun.com/uploads/9/8/7/6/9876061/animal_puzzles_1014.pdf. There are also online games and apps such as Switch Zoo which do this. 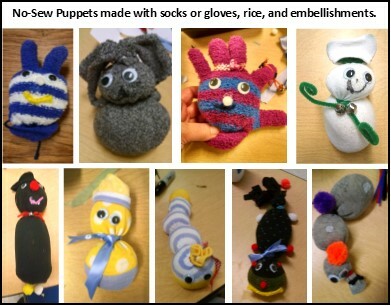 No-sew “beanbag” animals: Kids could make an animal by filling a sock or glove with rice, tying it off with elastic hair ties or string, and decorating it. 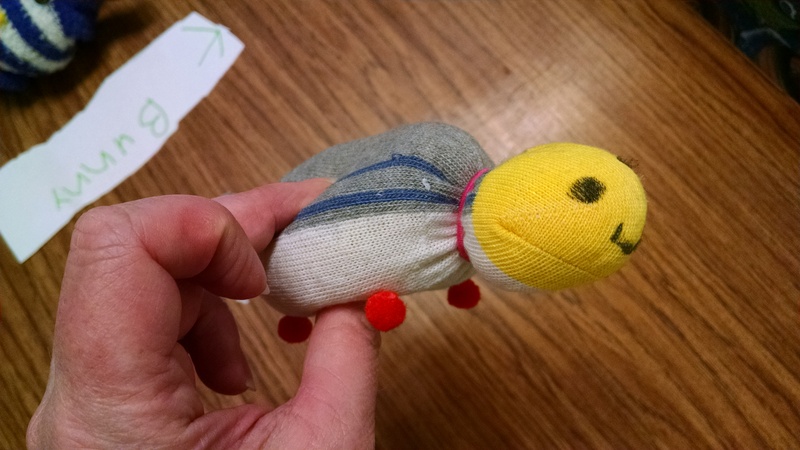 To make a snake, use a small child’s size knee-length sock. Fill it some, tie it off, fill some more, tie it off again, etc. To make a bunny, use an adult size ankle-length sock. Fill the bottom half with rice for the body and tie it off. Fill the next quarter with rice for the head and tie it off. Then the top of the sock gets clipped to make bunny ears. Then you can decorate with googly eyes, pompoms, ribbons, and other embellishments. It’s really important to have good glue, like “Tacky” Glue. We only had Elmer’s that day, and it was a struggle! Here’s a collection of animals – click on it to see a bigger image. Bird feeders: Option 1: In the microwave, heat vegetable shortening (Crisco), then stir together with bird seed. 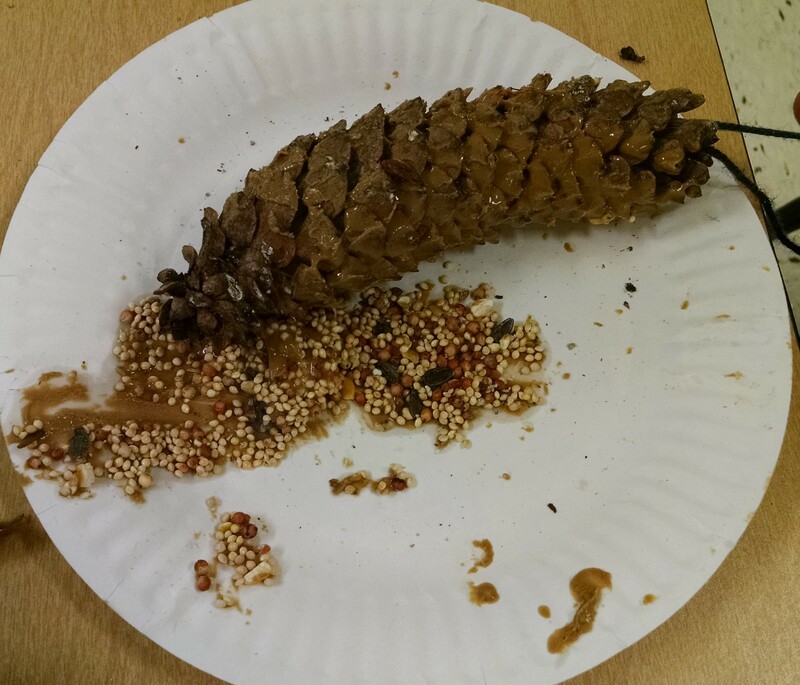 Tie a string on a pinecone, and slather the pine cone with bird seed goo. Option 2: Tie a string on a pinecone. Spread on peanut butter or sunflower seed butter on. Roll it in birdseed. 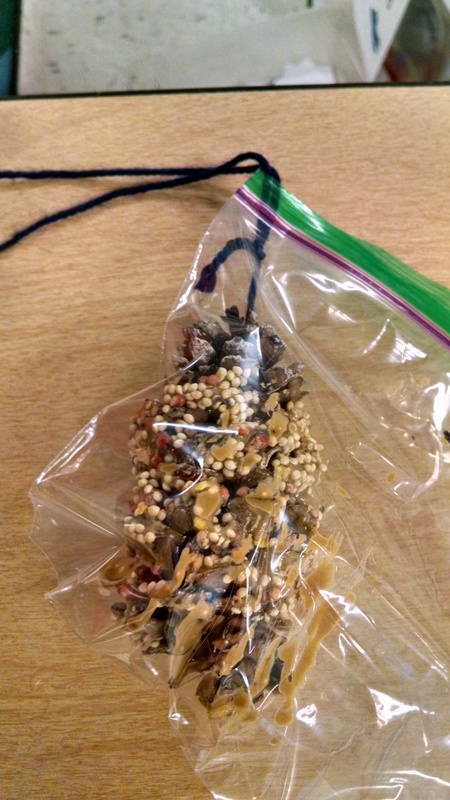 Tip: when you put this in a ziplock to take home, be sure to leave the string hanging on the outside of the bag so it doesn’t get covered in goo. 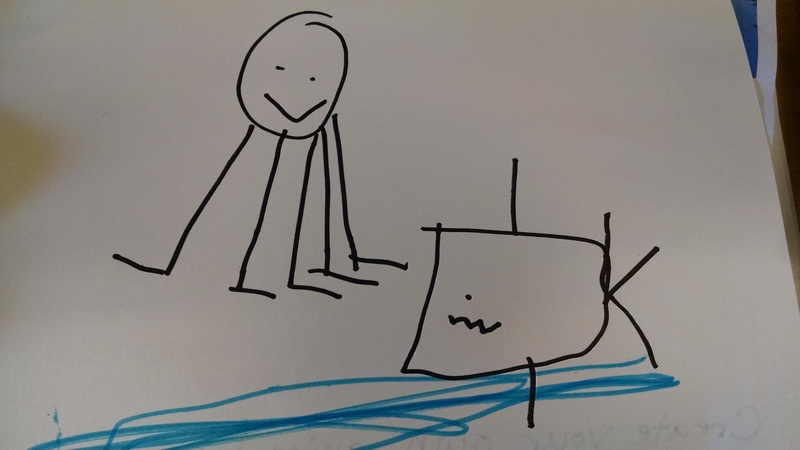 Design your own creature: We had a drawing table with paper and markers, and some prompt questions encouraging them to design their own creature… what kind of skin would it have, how many legs, would it lay eggs or have live babies, and where would it live. 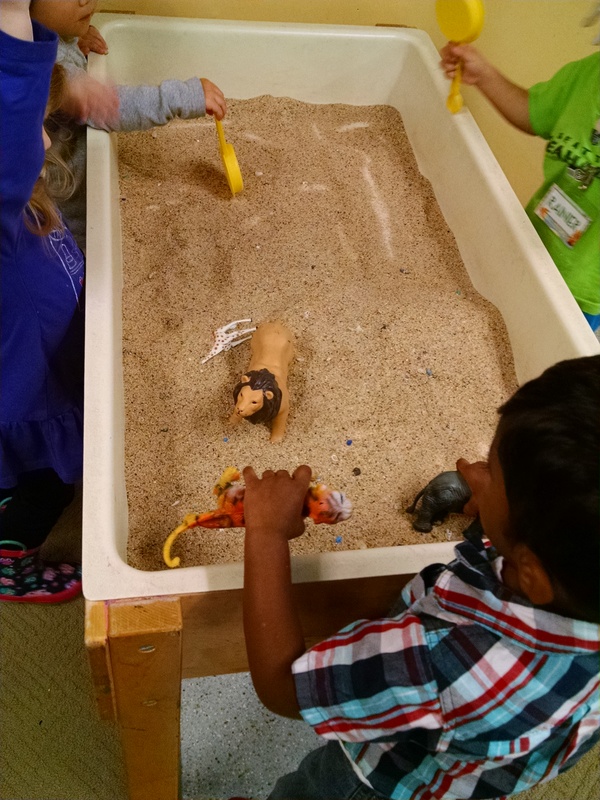 Sensory table: Simple… just sand and plastic animals (ideally desert animals) and sifters to shake sand over the animals. Water table: Toy aquatic animals: fish, marine mammals, amphibians. Some rocks for the amphibians to sun themselves on. Fish tank nets to catch the fish with. Finger puppets: We had a collection of animal finger puppets for imaginary play. 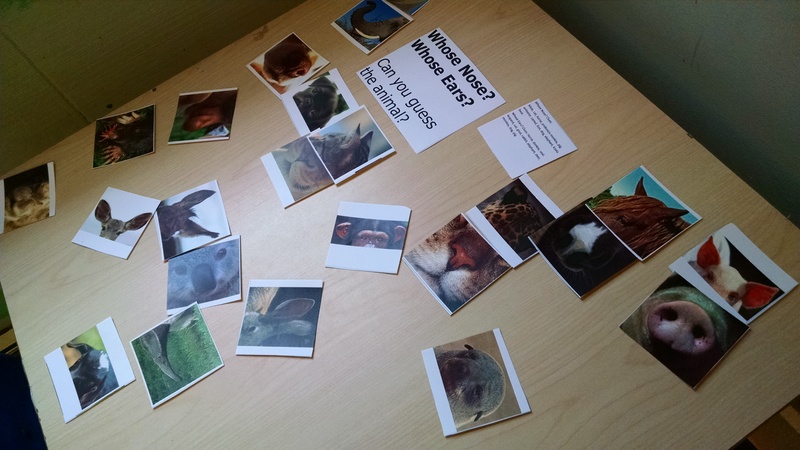 Animal puzzles: We put out four puzzles with farm animals and zoo animals. For manipulables, we try to put out things of different skill levels. So, a peg puzzle that was easy for little ones, a puzzle where you match two halves together to build an animal, a 24 piece jigsaw, and a cubes puzzle that has 6 different puzzles on the 6 sides of the cubes, so you have to figure out first which side to use, then how to put the puzzle together. One of these things is not like the other: We laid out sets of four finger puppets, and sang the song from Sesame Street, and asked the kids which puppet didn’t belong, and why. We started easy and got harder. The first set was three identical snake puppets and a dragon puppet. The second set was three mammals and a duck. The third was three things that swim and one that doesn’t. Book: Is Your Mama a Llama? 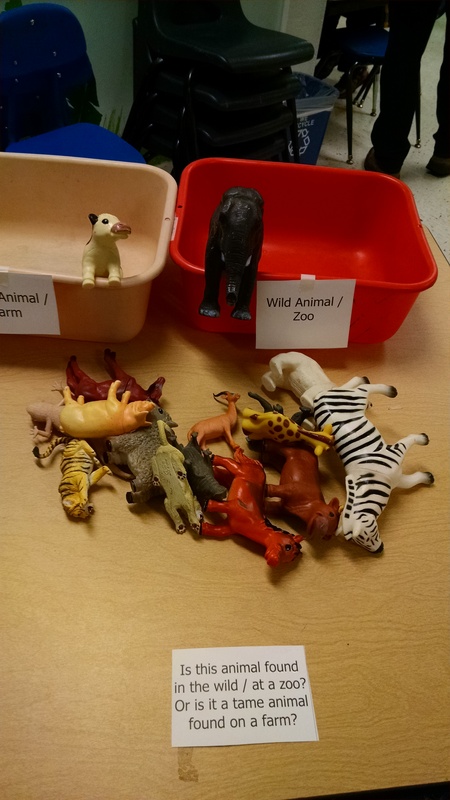 Animal spinner: One teacher created a spinner with pictures of lots of animals. A child would spin, and whichever animal came up, we all pretended to be. So, we’d have kids quacking and waddling around for a while, then say “OK, we’ll stop being ducks in 3 – 2 – 1.” After they all sat back down, the next child spun, and we were all gorillas. You could also do this as charades: the child who spun wouldn’t tell anyone what the animal was, and they would act it out and have people guess. This would likely work for ages 5 and up. But, for our 3-year-olds, as soon as they see what they spun, they announce it out loud. Monsters: We included “monsters” in two of our activities last year. With the puppets at opening circle we showed a unicorn and a dragon, and asked about their characteristics, and asked what kind of animal they were and whether they really existed. So, a unicorn is like a mammal, but doesn’t actually exist. With the buckets at the fishing pond, we had one labelled monsters that the mermaid and other mythical creatures went into. It’s a fun thing to include, but you can decide whether it works for you or whether it feels like too many concepts to roll into one class. Who’s Like Me? This is a lift the flap (uncover and discover) book, where one animal says “I’m a bunny. I am furry and breathe air. Who’s like me?” Then there are flaps with feathers, scales, spotted skin and fur. When you lift the flaps you reveal a pigeon (I have feathers, not fur), a fish (I don’t breathe air), a chameleon (I don’t have fur), and a fox (yes, I have fur and breathe air like a bunny). Tip: In our morning circle, we had a little chaos as every kid wanted to lift the flaps. So, in the afternoon, we announced before starting a page which children would be responsible for the flaps on that page, and asked all the other children to sit back and wait for their turn. How Are They the Same? by Kalman. Age 3 – 7. This book is a great visual aid for any class where you’re addressing the idea of “same” and “different” or compare and contrast. It is especially good for a class on animal classification. Each two page spread shows several photos, then asks how the things shown are the same or different. For example, on the pages with a leopard, a leopard butterfly, a leopard gecko and a leopard frog: “This cat is a leopard. A leopard has spots on its coat. How are these animals the same as a leopard? Are they cats too?” See above for how we used this book in circle. There are a couple lame pages in the book – the opening page of random “words to know” and the dino activity at the end, but as a whole, it is quite good for our purposes in the class. I especially like the ‘notes for adults’ section at the back that has extension activities such as sorting stuffed animals and drawing pictures of animals in categories. Creaturepedia: Welcome to the Greatest Show on Earth by Barman. Ages 6 – 9. This is a big hefty book – over 200 pages – there are kids who love big books. Illustrations are fun “kids book” style illustrations, but still reasonably scientifically accurate. 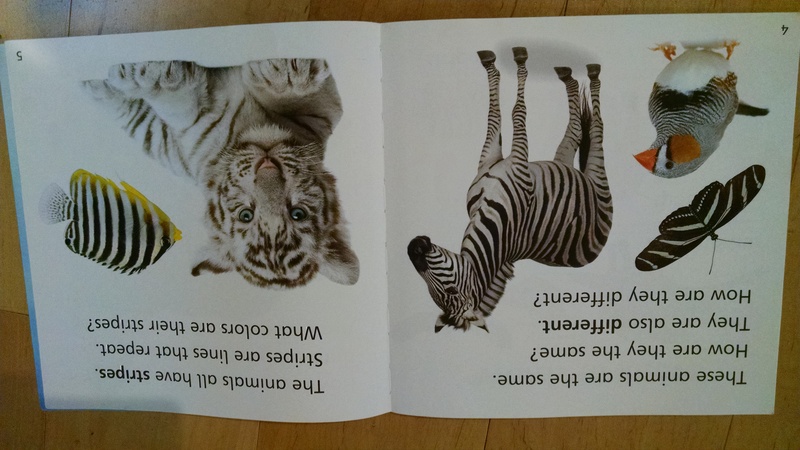 Each page spread lists a “category” and then shows several animals that fit that category. The fun of this book is how it assigns animals to new categories: “the prickly ones” includes armadillos, porcupines, horseshoe crabs, sea urchins, prickly leaf beetles, and more. “The show-offs” fill multiple page spreads and include: peacock, gray crowned crane, red deer, martens, and bowerbirds. If you’re a teacher who likes to teach one concept really clearly and doesn’t like to confuse matters by adding in more ideas, then this is not the book for you. 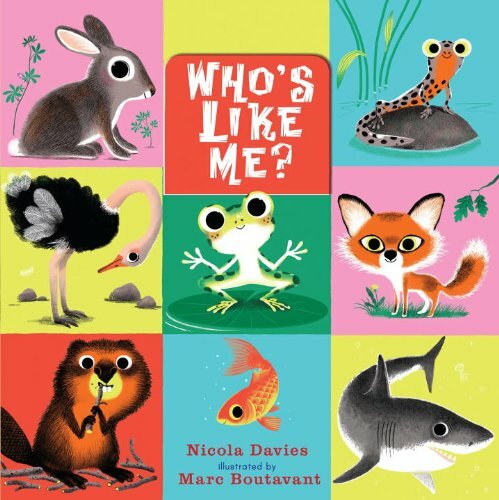 If, like me, you like to teach one concept clearly, but then encourage them to play around further with the idea of classification by seeing what’s alike and what’s different, you may well like this for your bookshelf, though not to read aloud. Bill Nye has some fun videos… go to YouTube and search for Bill Nye Reptiles or Bill Nye Mammals, and so on.